It’s her or me. There’s not room in this city for both of us. Either she goes, or I go. End of story. I’m not one usually given to ultimatums. Personal history had taught me that in the war between either and or, or usually wins. And if or wins, I lose. So I go quietly along my way, occasionally raising my head above the parapet when I come across something untenable. And when the untenable moves further up the alphabet and becomes unbearable, I leave. Or I quit. Or I declare the person responsible persona non grata. But I don’t resort to ultimatums. In his Devil’s Dictionary, my old friend Ambrose Bierce defines an ultimatum as ‘a last demand before resorting to concessions’. But I’m way beyond conceding. This woman’s presence is driving me demented. You know of whom I speak? The new voice of BKV. The one that tells you to connect here for Metro Line 1, 2 or 3. Or for the railways. Or for the suburban railways. Let’s be clear: I have nothing against the woman personally – whoever she is. I’m sure she’s a lovely person who is doing what she can to earn a forint or two in a city where ready money doesn’t come easily. What I am objecting to is BKV’s decision to have a non-Hungarian announcer on its transport system. I didn’t come to Hungary to hear the dulcet tones of a British announcer over the PA system. Yes, it helps to hear it in English, but give me good old accented English any day. I’m in Hungary. I’m not in the UK. I don’t need the added grief of having to double-check my whereabouts every time this petal makes an announcement. How hypocritical, I hear some of you say. Am I not the one first in line to complain about the incorrect use of English in this fair city of ours? Am I not the one who finds it difficult to trust the quality of food in a restaurant that offers chicken stripes and cucumber soap on the menu? Am I not the one waging a none-too-silent war against apostrophe abuse? Én vétkem, én vétkem, én igen nagy vétkem. I am guilty on all three counts. Ergo, shouldn’t I be happy that the BKV has seen fit to partially compensate for the less-than-stellar English it used to feature on its notices and signs by employing a native-English speaker to make announcements … in English? Perhaps. But I’m not. I feel robbed. I feel cheated. I feel misled. And, of course, this somewhat irrational response to what researchers would credit to be a move in the right direction – i.e. the main road to credibility – has me second-guessing myself. A couple of years ago, researchers from the University of Chicago (Shiri Lev-Ari and Boaz Keysar), ran some experiments testing the correlation between credibility and the difficulty in understanding a non-native speaker. They talk of ‘processing fluency’ and ‘processing difficulty’. In a nutshell, they posit that most non-native speakers have an accent and that having an accent could make them seem less credible for two reasons: (1) The accent is a signal that the speaker ‘doesn’t belong’ and (2) it makes the speech harder to process. In the case of an accent being a signal, the researchers say that it is the prejudice of the listener and not the accent itself that impacts credibility. This I can buy. They also say that people tend to believe non-native speakers less because they are simply more difficult to understand. mmmm… I wonder. So, back to her nibs on the tram. Her English is perfect (even if her hammed pronunciation of Moritz Zsigmond tér grates on my usually deaf nerves). Her accent is native. Her speech is faultless. And yet I have trouble believing that I’m in Budapest and that if I get off at Ferenc Korut (oops, I meant Corvin Negyed), I can connect to Metro Line 3. Why do I find this so irritating? Given that some Hungarians speak more accurate English than many native-English speakers I know, I just can’t see the sense in this. Not being one to shy away from a little navel gazing, I devoted a full 13 minutes to figuring out what was at the root of my antipathy. And it’s simple…really. Borrowing an analogy from a wise man I met recently in Palm Springs, I don’t want Europe (and Hungary) to go the way of the American melting pot where cultures combine to form a hybrid and no-one is really sure who they are any more. I would rather see it adopt Canada’s mosaic approach: individual countries forming a lovely picture, each retaining its individuality. Let’s not cross the narrow line between assimilation and obliteration. Hat tip to Craig at Clearing Customs for alerting me to this study. New Jersey: Armpit or Garden State? I was quite surprised to be told that New Jersey is referred to as the armpit of America. From where I was standing, sitting, walking, sleeping, eating, drinking and breathing in the city of Hoboken, it seemed anything but. 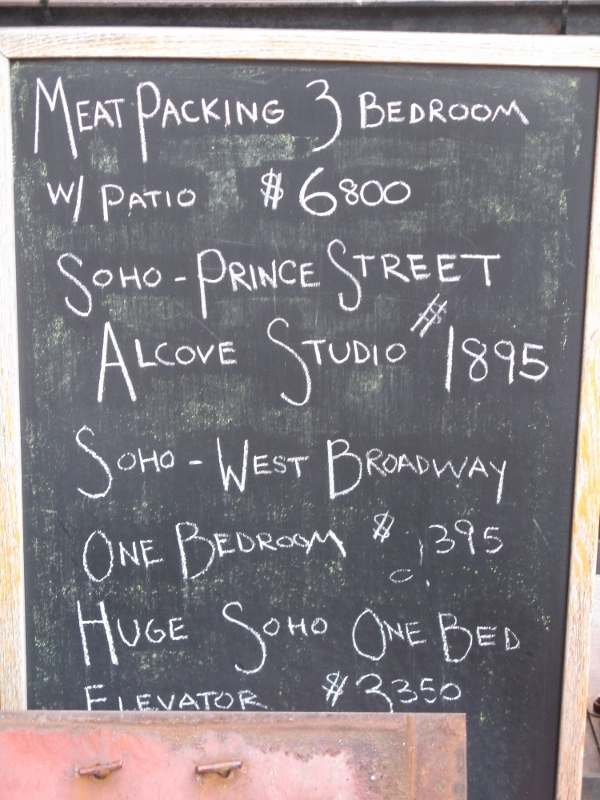 In fact, I’d go so far as to say that if I had the money, I wouldn’t be at all averse to living there myself. shops that have more than chick lit and sci fi on their shelves. Old record stores. Unique boutiques each with their own distinct style and fashion (there’s no sales tax on clothes in NJ). Not a chain store in sight – except for the pharmacies like CVS. Fresh vegetable stands. 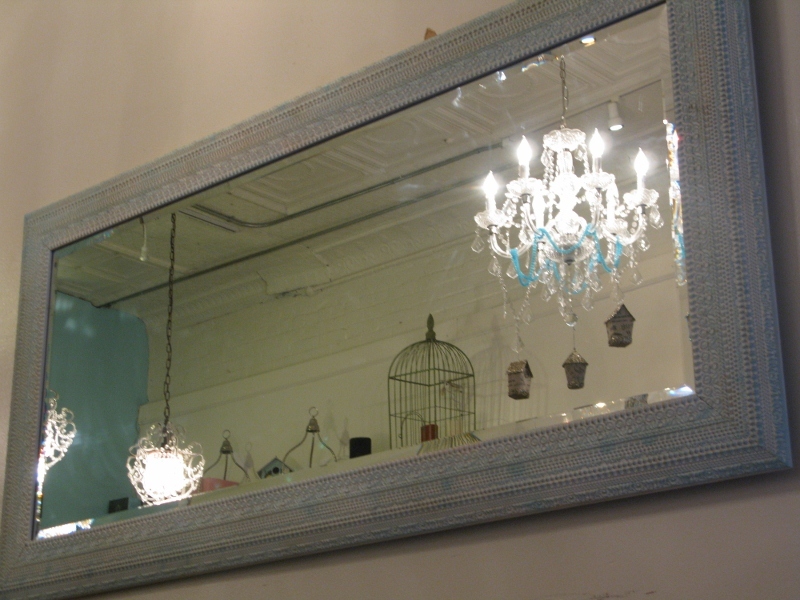 Designer furniture stores. Quaint cafés and outdoor restaurants. Yes, I could definitely live in Hoboken, if for nothing more than the view across the Hudson and the 24/7 PATH to Manhattan. But back to that armpit. I didn’t know that Ellis Island and the Statue of Liberty were both in NJ and not in NY. And I didn’t know that the first ever baseball game was played in Hoboken on 19 June 1846. I didn’t know that NJ has more horses than Kentucky or that both of the NY state football teams reside in the state but don’t take its name. With that much going for it, can it be all that bad? It does have the highest population density in the USA with an average of 1,030 people per sq. mi., which is 13 times the national average. And it’s the largest chemical producing state in the nation. And it has the Sopranos. But all said… for a first-time visit, I quite liked the state. Or at least what I saw of it. And yes, I did fly into Newark. Oh … and it’s illegal in NJ to pump your own gas. No such thing as self-service there! https://unpackingmybottomdrawer.com/wp-content/uploads/2017/06/logo-300x82.png 0 0 Mary Murphy https://unpackingmybottomdrawer.com/wp-content/uploads/2017/06/logo-300x82.png Mary Murphy2012-08-30 09:53:312016-08-10 11:42:20New Jersey: Armpit or Garden State? Ever since I saw Andy Warhol’s rendition of a tin of Campbell’s soup in the San Francisco MoMA, modern art has confounded me. For the most part, my singular lack of appreciation for modern art doesn’t come between me and my sleep. I know what I like, and, better still, I know what I don’t like. 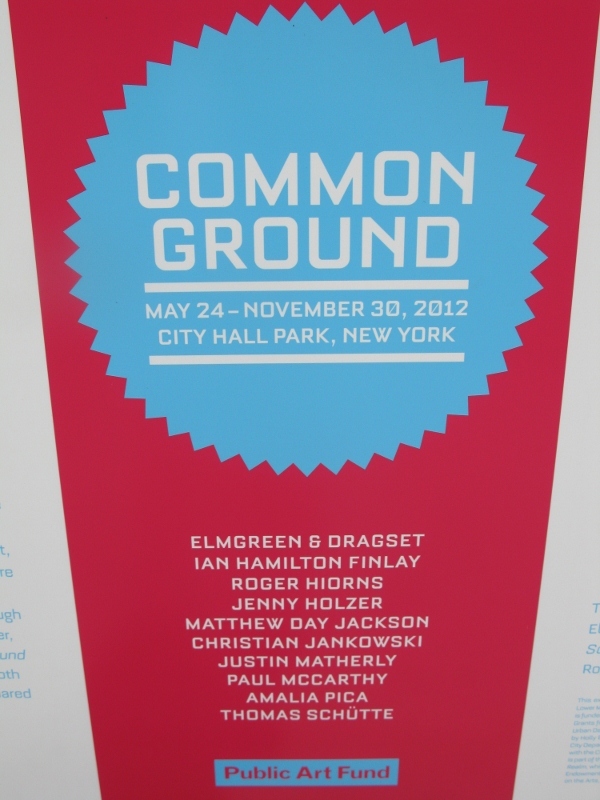 Yet I was struck again by this inability to ‘get it’ when I stumbled across the Common Ground Exhibit in New York a couple of weeks ago. If you hear a voice within you say ‘you cannot paint,’ then by all means paint, and that voice will be silenced. And you can still keep them in your attic! Finally, I hit on Aristotle’s The aim of art is to represent not the outward appearance of things, but their inward significance. Now we’re getting somewhere. Inward significance. 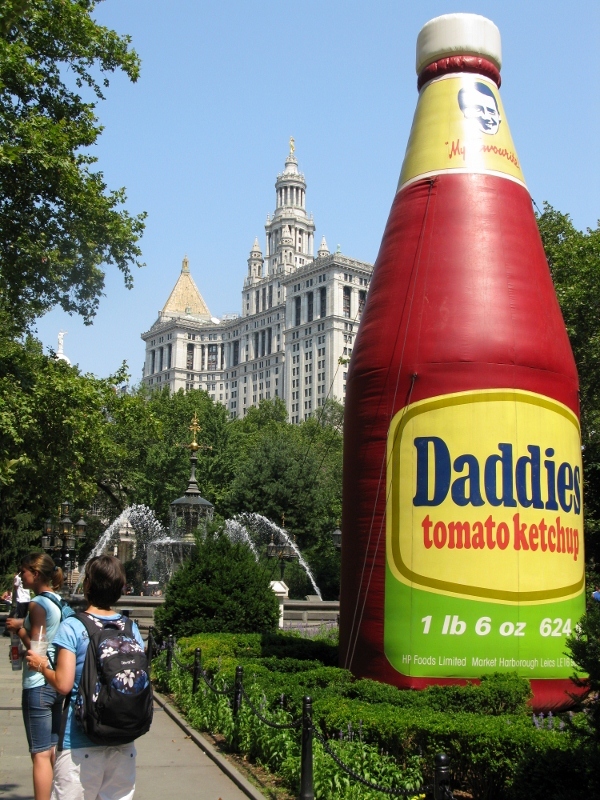 But how to find the inward significance of this giant ketchup bottle (2001) by Paul McCarthy? According to the New York Times, ‘Mr McCarthy’s ketchup bottle, aligned with the dome of City Hall, makes a kind of Neo-Pop-psychoanalytic connection between patriarchy and power, with Mr Bloomberg playing the role of a creepy authoritarian rather than a benevolent daddy.’ Now I ask you, how would I ever have come to that conclusion on my own? How many years of education would I have needed to recognise the significance of this piece? What would I have needed to have experienced in my life so far to make that giant ketchup bottle more than just a giant ketchup bottle? Christian Jankowski’s granite slab was more up my street. This I could get. Or so I thought. 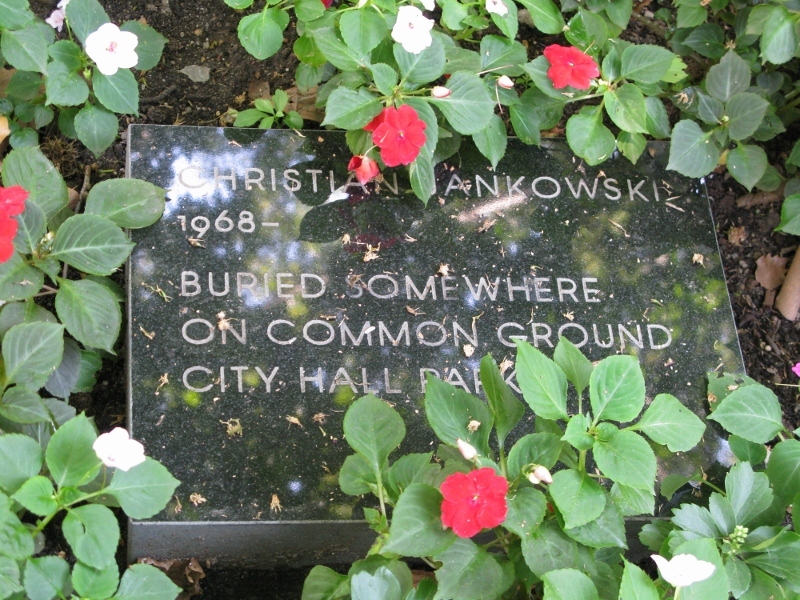 A simple expression of the artist’s wish to be buried ‘somewhere on common ground’. The inward significance in this case is very much mirrored in the inscription. A case of it being what it is and no more. And I checked with the New York Times… and I got this one right! 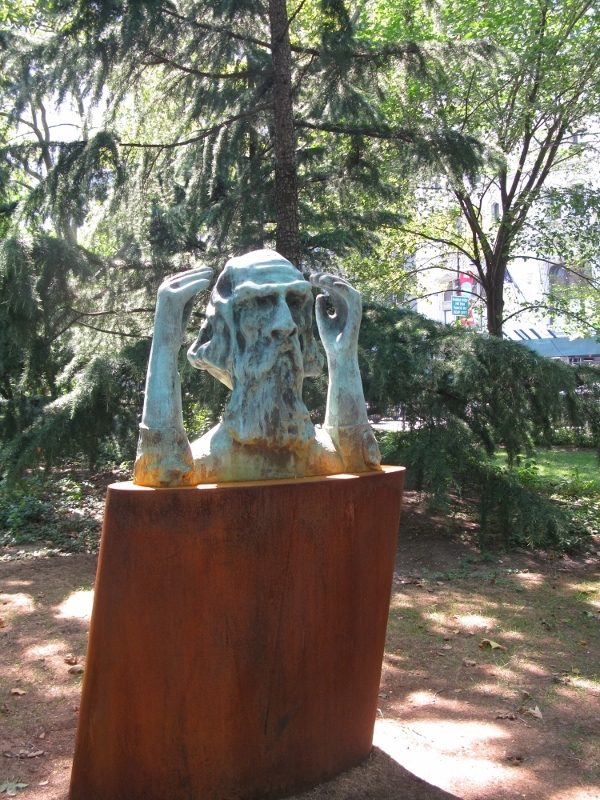 In Thomas Schütte’s Memorial for an Unknown Artist (2011), I can see the angst of not being recognised. The frustration of no-one knowing your worth. The tragedy of great talent remaining undiscovered. The hands-to-head feverish clutching seems vaguely familiar. Do I recognise it as something I have experienced myself? Is this inward significance thing more about my innards than those of the artist or the art form? Do I feel as though my talent is unrecognised? Am I hiding my light under the proverbial bushel? Sweet Mother of Divine Jesus… do I need therapy? Stop! Enough! Give it up, Mary, and admit that you have neither the wherewithal nor the inclination to be arty. So most of it goes over your head… that’s not a bad thing. Just think of the damage it might do if it actually got into your head! People change. Every day. We age. We put on weight. We lose weight. We restyle our hair. We get glasses. We try contacts. Places change, too. New buildings. New skylines. New owners. New management. This funny old world of ours is never the same two days running. Budapest, particularly, is undergoing a massive transformation. Shops and cafés and restaurants are closing down. New ones are opening up. Because something is there today doesn’t mean it will be open tomorrow. Because the food is good today, doesn’t mean it will be good tomorrow. And as for the service… excuse me while I take a deep breath. Back in 2009, I discovered Épitész pince and I blogged about it. Now, three years later, I practically spent the weekend there and found that amongst life’s myriad changes, Épitész has remained a constant. On Friday, JFW had his not-a-stag-do there. It was not-a-stag-do in that the party included both men and women… and his mother. A trifle non-traditional. 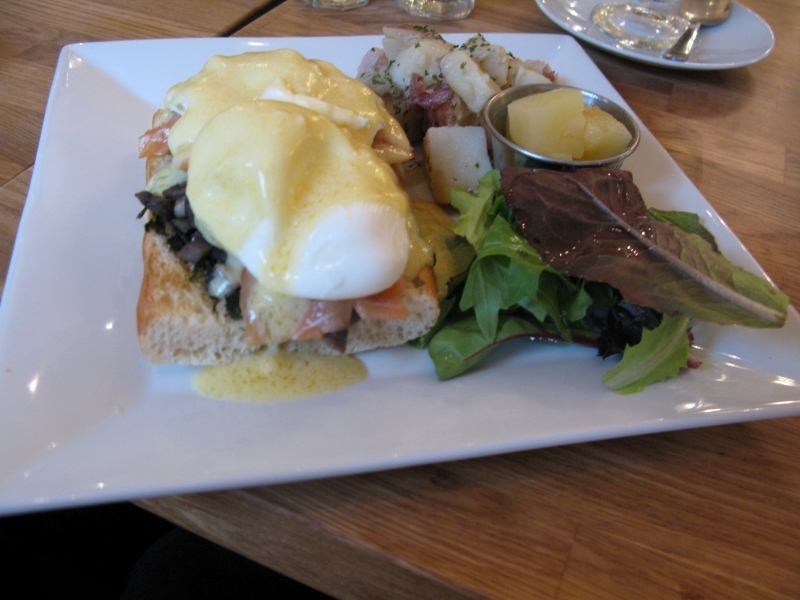 The food was excellent and the service remarkably smooth. 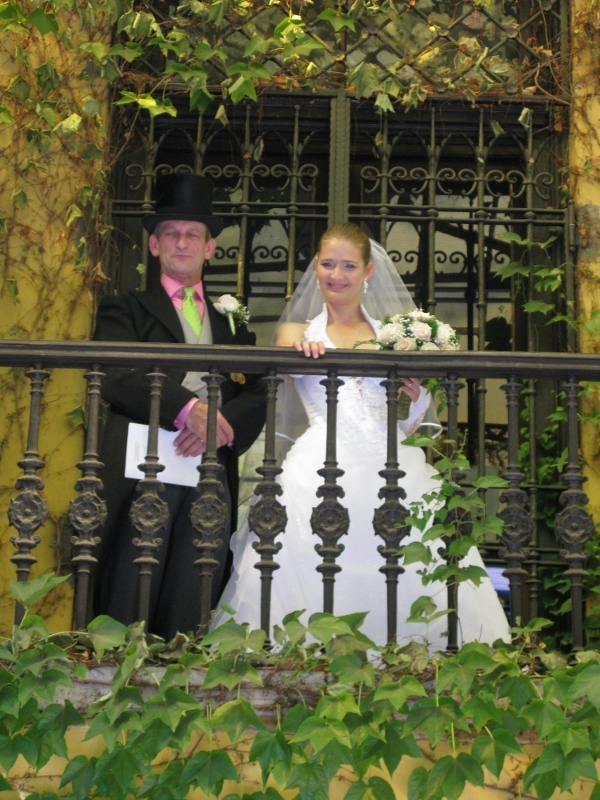 On Saturday, we were back there again for the wedding. And it was beautiful. The courtyard setting. The ivy-covered balcony. The stone steps. All so very Romeo and Juliettish. And ever so romantic. About 40 sat down to dinner and conversation flowed as people made new connections and reconnected with old ones. Two waiters worked the floor. For the first time in Budapest, I never had to repeat an order – just catch their eye and nod and my Havanna gold was delivered. And the pleasantness never waned. Truly remarkable. 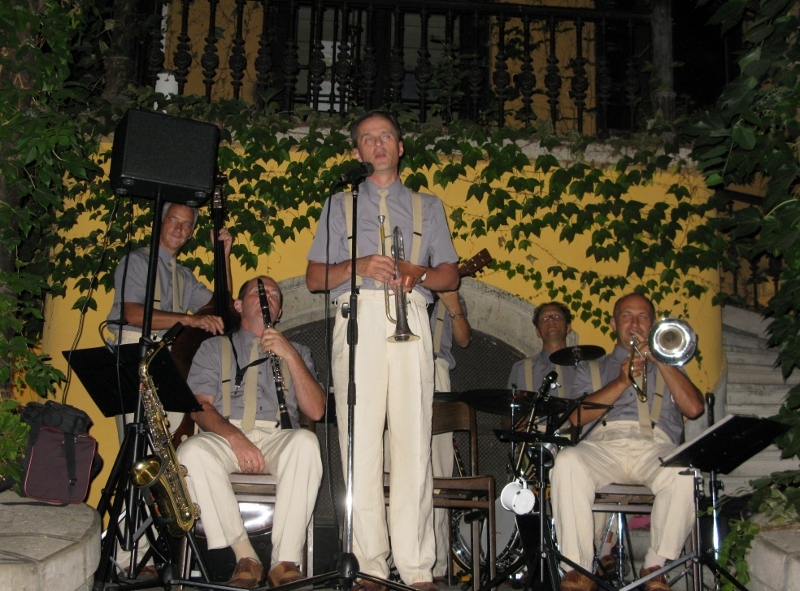 The Hot Jazz Band entertained us till 10 pm and then DJ Ábrahám Zsolt took over in the adjoining gallery and played a storm. Songs I could sing to and dance to, too. Haven’t heard many of those in a while. What struck me about it all though was that the good things in life never go out of fashion, they never change. Love is love, no matter where you are in the world. Friendships thrive despite the miles that separate. And people coming together to celebrate is something that has been around since the dawn of time. Add that heady mixture to Épitész pince, what has for me become a sanctuary of sorts, and you have a recipe of success. If you’re in the market for a venue that will live up to expectations, then look no further. This week, as Mr and Mrs JFW, embark on married life, I am grateful for the constants in the world – love, friendship, and reasons to celebrate – the benchmarks which keep us grounded and furnish our reality with strength and fortitude. not including tip – mind you, the floor show alone (Tom Cruise eat your heart out) warranted the full 15%. But still I’m left wondering what people do to earn enough money to have the same quality of life that I have here in Budapest. My neck did a great imitation of a periscope as I turned and twisted to ogle one person after another. I use that word advisedly as I was, on a number of occasions, staring quite rudely. The people are fascinating. The neighbourhoods so unique. The sense of ..well… America… is tangible. And of course, why wouldn’t it be? 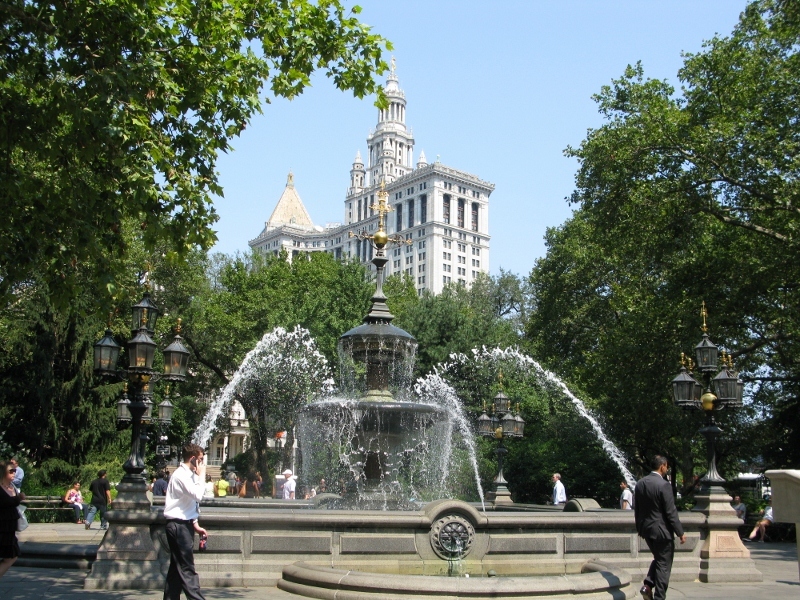 New York ranks up there as one of the most famous cities in the world. It was the first Capital of the USA. The Fashion Institute of Technology in Manhattan is the only school in the world offering a BSc with a Major in Cosmetics and Fragrance Marketing. Imagine how quickly that one would get you a job in the EU. We forget (or at least I do) that New York is both a city and a state and quite surprisingly, dairying is the most important farming activity with over 18,000 cattle in residence. It has 722 miles of subway track and it would take a week at least to get to grips with the alpha-numerical combinations and permutations so that you can figure your way around. The New York Post established in 1803 by Alexander Hamilton is the oldest running newspaper in the United States. The pet cemetery in Hartsdale was established in 1896 and contains 12,000 plots. Was that where Stephen King got his inspiration? Ever wondered who Uncle Sam was? None other than Sam Wilson, a meatpacker from Troy. During the War of 1812, he stamped ‘US Beef’ on his products and soldiers interpreted the US abbreviation as meaning Uncle Sam. New York is also home America’s first pizzeria opened by Gennaro Lombardi in 1895. So what did European settlers bring with them? Apple seeds. In the 1600s. But that’s not where the moniker ‘the Big Apple’ comes from. It’s a term coined by musicians meaning to play the big time. And in return, New York gave Europe toilet paper, invented by Joseph C. Gayetty in 1857. Full of surprises, the buildings are old, beautiful, tarted up and run down. 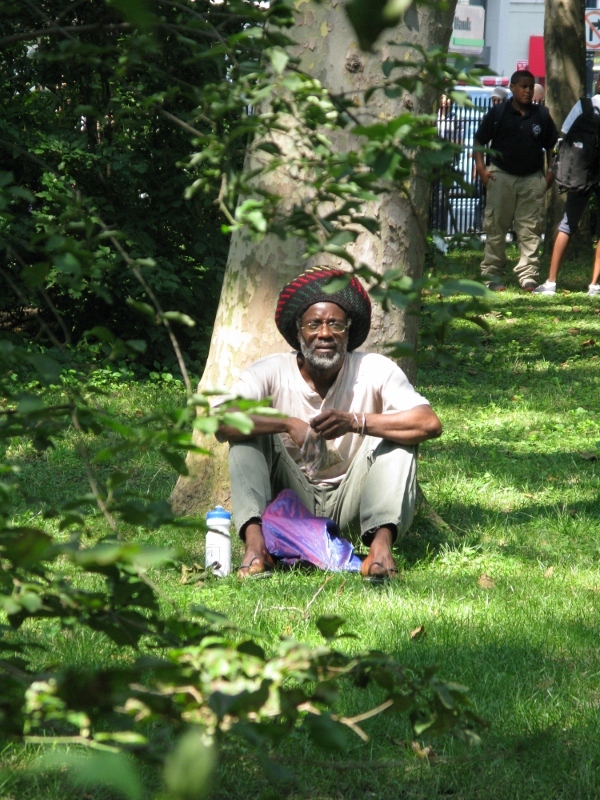 New Yorkers take to the outdoors to have their lunch and parks are full of sandwich- and salad-eating professionals each with their omnipotent cup of coffee from Starbucks. There are so many outlets that I suspect Starbucks is somehow sponsoring the city. I ate Korean food for the first time at Do Hwa and can recommended it as something to try once before you die. I don’t think I’ve ever tasted anything quite like it and can only assume that the experience would be greatly improved had I a native at hand who could just order for me. Did I enjoy my time there? Definitely. Would I live there? Definitely not. But never say never… stranger things have happened. After all, I did move to Budapest thinking it was near the sea. Want some more fun facts on New York? I must be the only person in the world who has not seen footage of 9/11. I was living in Alaska at the time and I didn’t have a TV. I’ve never felt the need to watch it since as I’m already up to my tonsils in man’s inhumanity to man. I wanted to see Ground Zero though, but the queue was too long and I was too hot and anyway, with that many people crawling all over the place, I suspected I’d have been as disappointed as I had been when I visited the Cistine Chapel. I’m all for limiting the number of visitors at any one time so that that I can actually enjoy the moment and not feel put upon to move on. I still wanted to pay my respects, so I popped into St Paul’s. 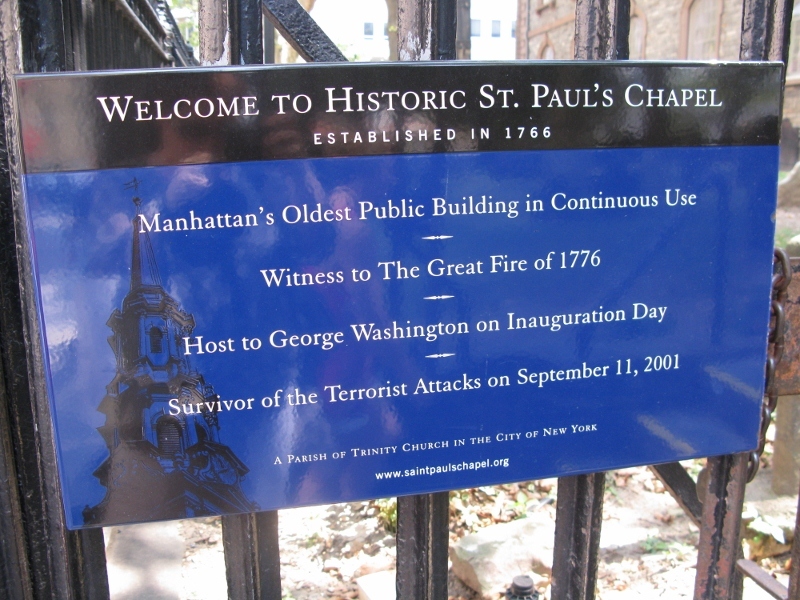 It’s hard to believe that it withstood the bombings and has been there since 1766. 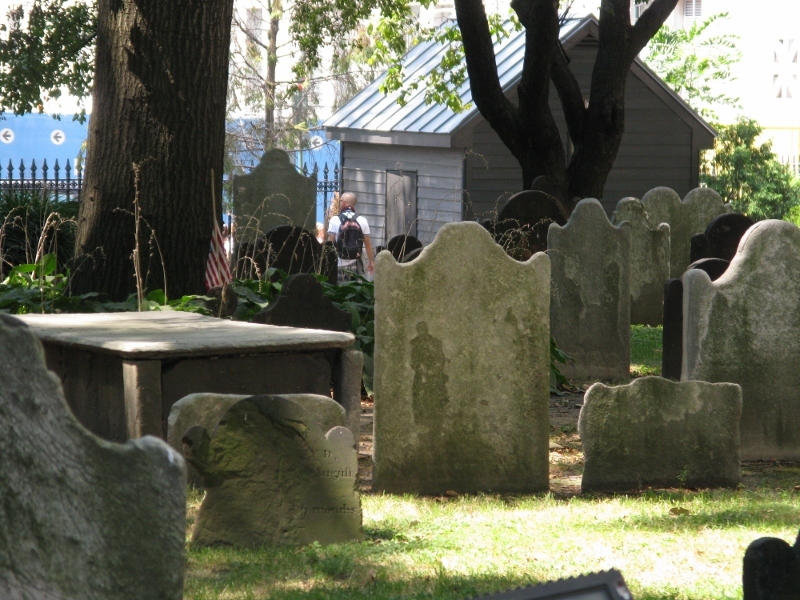 I quite fancied that I saw shapes in the shadows of the tombstones and spent quite a few minutes wandering the cemetery. One stone in particular caught my eye, erected to the actor George Frederick Cooke (17 April 1756 – 26 September 1812), father of the so-called romantic style of acting. The stone was erected by Edmund Kean, the man who made that style famous. On it is written: Three kingdoms claim his birth; both hemispheres pronounce his worth. Not a bad legacy at all. 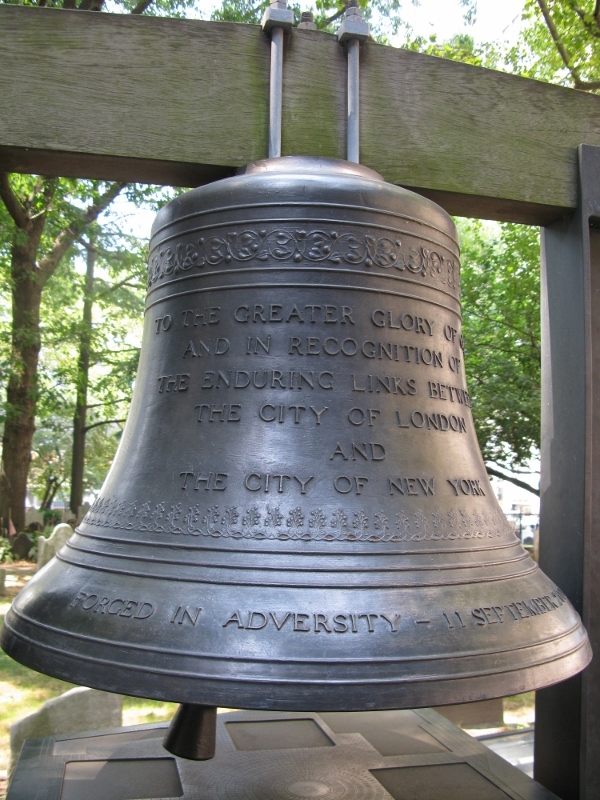 Close by stands the Bell of Hope, which was presented to New York by the Mayor of London and the Archbishop of Centerbury in 2002. On each anniversary of 9/11 it is rung in memory of those who lost their lives. It also rang on 11 March 2004 when the bombs went off in Madrid, and on 7 July 2005 when London was hit. Symbolising the triumph of hope over tragedy, it would be nice if it tolled just once a year from now on. It is rung to honor the achievements of all peacemakers who srive, in ways big and small, to work for reconciliation around the world. 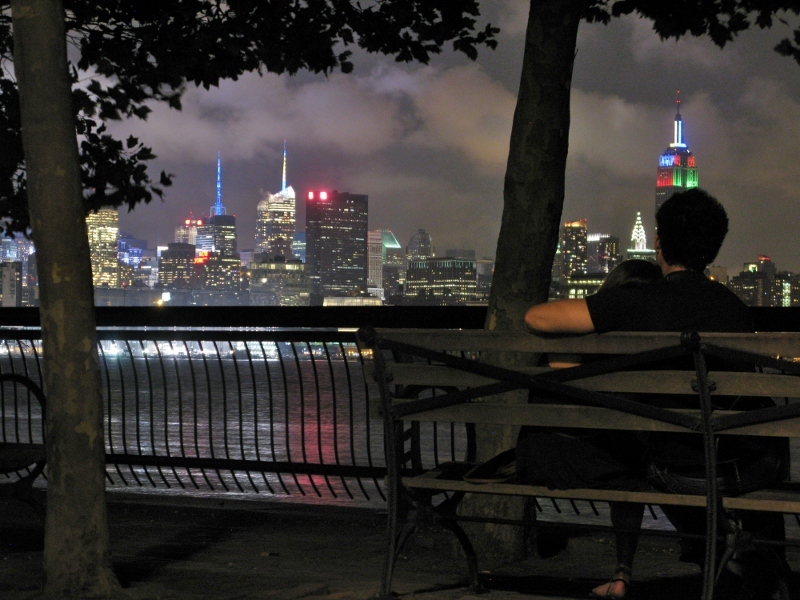 The view across the Hudson River is spectacular, especially at night. 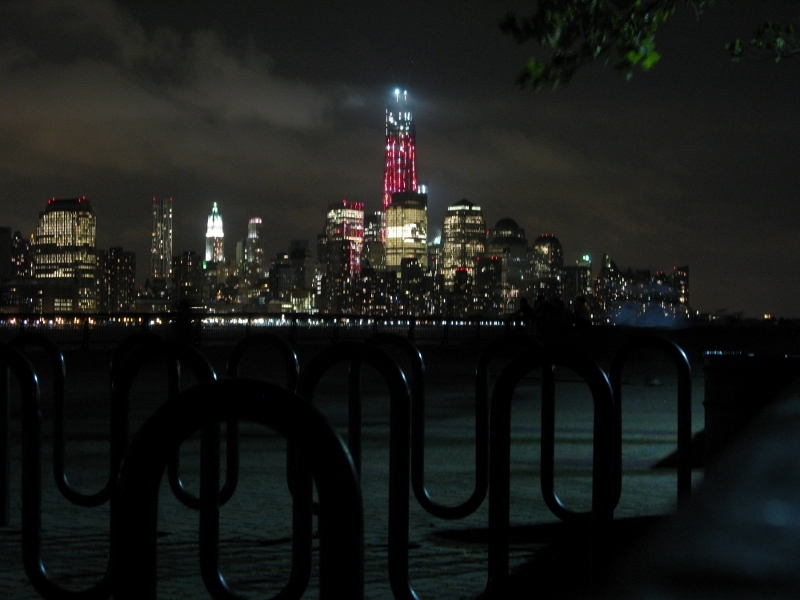 The Empire State looms large and the new World Trade Center towers pink over the skyline. It’s calm. It’s quiet. It’s serene. And for a built environment, it’s gobsmackingly gorgeous. I’ve long since been a lover of New York. The accents, the busyness, the sheer size of everything. And although it’s been ten years or so since I was last there, I didn’t think it could grow to dislike me. I’m finding it difficult though to divorce one bad experience and stop it from colouring my whole perspective. You think too much. You don’t think at all. Both accusations have been levelled at me over the years with neither one nor the other reigning supreme. I had a mission: to buy a camera for a mate. I had a budget. I knew what I looking for. And I wasn’t expecting to be scammed. On 34th and 7th Avenue, there’s a camera shop. Lots of cameras. Nice lads working inside. I had a great chat with one of them. We talked of what I wanted and we bartered. He came down from €499 to €269 + tax. Now, I hear you shout with incredulity, that should have been my first wake-up call. But I say again, in my defense, I wasn’t expecting to be scammed. He said he’d dump the box as I was travelling and it would be better for customs. How nice, I thought. When I got back to the flat, I googled it so that I could send a picture to BP of what I’d bought. That’s when my stomach turned to lead and I felt completely and utterly betrayed. The self-same camera was on the manufacturer’s site for $139. Of course the receipt said ABSOLUTELY NO REFUNDS. Why hadn’t I noticed that earlier? A little research into NY consumer law showed that I had little chance of getting my money back. I was gutted. The bright lights were no longer nearly as bright. And the view from where I was sitting had tarnished. Back I went the next day, this time with my mate ST and her smart phone. I breezed in and said a big hello to my old friends, having since decided that stupid was the way to play it. I said that I must have taken home the wrong camera yesterday as the one I had was available for a lot less than I’d paid for it. There was some mutterings about refurbishments until I mentioned the Fuji site. So they offered a replacement – a full exchange. No cash, of course. I came away with more camera for my money but left a piece of me behind. I’ve spoken before of my gullibility. I know that I can be too trusting. But I simply refuse to believe the worst of anyone, unless they’ve given me reason to. What would the world be like if we didn’t trust each other? I dread to think. But then again, don’t these blokes have daughters, sisters, wives and girlfriends that they would hate to see treated the way they treated me? Why is it always one rule for me and my brethern and another for everyone else? I despair. New York will never quite hold the same magic for me. I’m sore. I’m sad. I’ve let it go – there’s no point in dwelling on it. But in case you’re in the vicinity of 34th and 7th Avenue, steer clear of that camera shop! 34th Street Camera and Computers, 460 7th Avenue. It’s been years since I’ve had a roommate. Yes, I have the occasional house (flat?) guest – but rarely for more than a week at a time. I’ve not had to share my precious space with any degree of regularity for a very long time. So when I heard myself saying: ‘sure – no problem – stay as long as you like’, I shocked myself. ‘As long as you like’ turns out to be a little over a month. And I was away for most of that – so in all reality, the co-share happened for one week, with a break, and then another week. But all the time I was away, I was house-sharing, too, (except for two days). So, in effect, for the last five weeks or so, I haven’t been living on my own. And surprisingly, I’ve lived to tell the tale. Actually, I’ve quite enjoyed it. My plants are good company but they’re not ones for talking back or offering an opinion. Spending a few hours in San Francisco pairing socks was quite a treat. Doing load after load of laundry (with a dryer) was better than a day out at Disneyland. Cooking for more than just me is downright pleasurable, especially as I don’t have to do dishes. And having my windows cleaned… now that made my year. 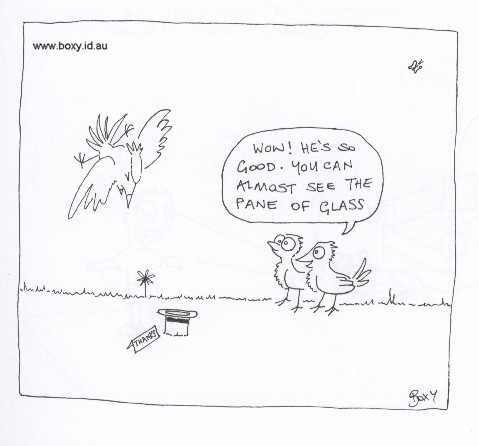 Who would ever have thought that glass could be opaque. I was getting a little worried there for a while that I might have gone beyond redemption, that I might no longer be fit to live with someone else. But as the inimitable GM gets ready to move across the river, I’m grateful that she’s taught me that I’m still livable with. All is not lost. What a relief! I’ve a strange fascination with statues. I’ve been known to talk to them and always listen to what they have to say. That’s probably more indicative of my mental state than their ability to converse but that said, I’m drawn to them and often find myself wondering what they’d say if they could talk. There’s a giant-sized statue of Marilyn Monroe in downtown Palm Springs. She stands 26 feet tall and weights 34 000 pounds. The child of Johnson and Johnson heir, 80-year-old Seward Johnson, Marilyn’s sculpted pose is one from the movie The seven-year itch. Marilyn formerly reigned in Chicago but the city has passed her on to Palm Springs where she’s quickly become part of the scenery. And she’s in good company. Another of Hollywood’s famous ladies is also in residence. Lucille Ball is quite the Palm Springs heroine. The Lucy House, one of the first homes she owned with Desi Arnez, is now open for residents. She is one of my all-time favourites. I even named my first doll (which I still have) after her. I have fond memories of splitting my sides at the ‘I love Lucy’ show which generated what is thought to be the longest laugh in live TV history. She was one funny lady. 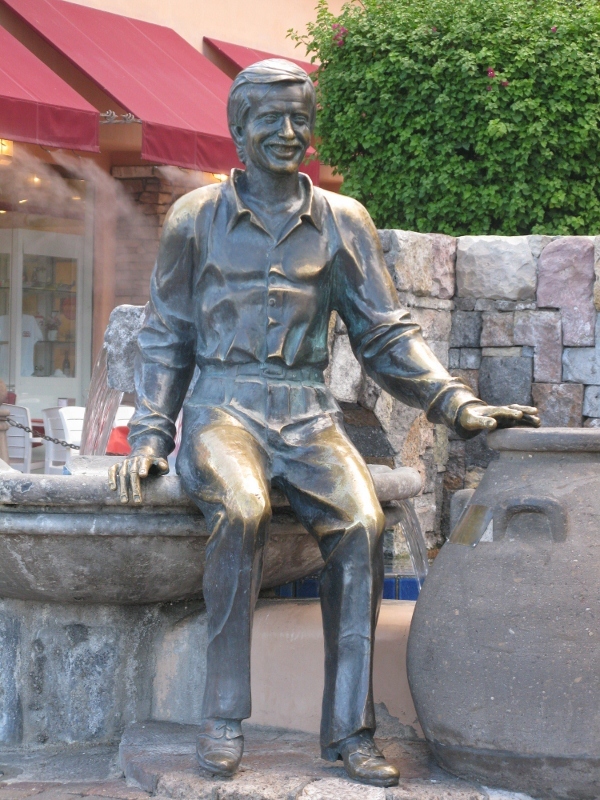 Another statue that keeps popping up in Palm Springs is that of Sonny Bono. He’s everywhere. 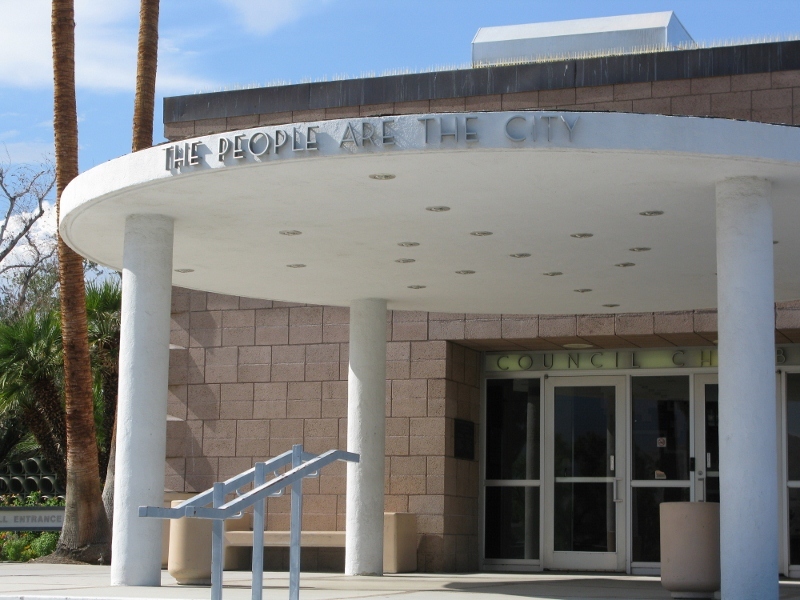 When he first went to Palm Springs, he tried to open a restaurant and was apparently so frustrated by the red tape that he decided to be the change he wanted to see – he ran for Mayor. He served four years (1988 to 1992) but you’d think it a lot more! In 1994, he became a member of Congress and is still the only member ever to have had No. 1 hit. But his political career was cut short when he died in a skiing accident in 1998. 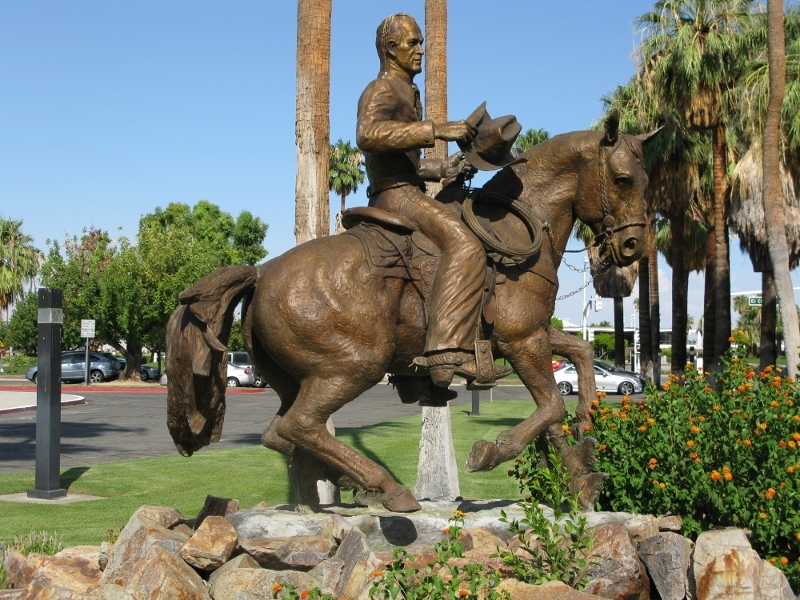 Sonny might have been king in his day, Marilyn queen, and Lucy Matriarch, but for me, the most interesting statue in town is that of Frank M. Bogert who was Mayor from 1958-1966 and again from 1982-1988. Truly a legend in his own lifetime, Bogert once described Einstein ‘the nicest little guy you’d ever want to meet’. He’s one man I’d like to have met. 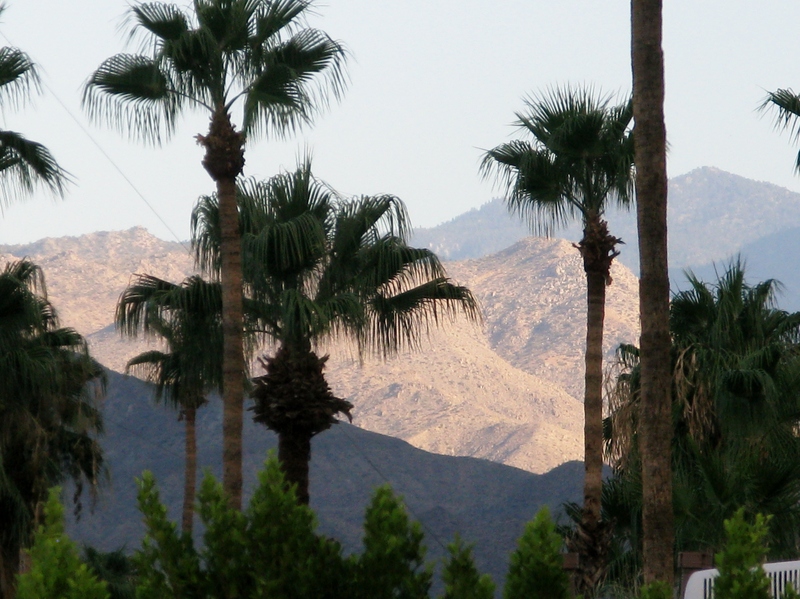 Palm Springs might be a little gentrified, but it has its share of homelessness, too. It might have an aging population, but young people are starting to return home – the boomerang babies, victims of the current financial crises. At the airport, as the dolls of downtown line up in their wheelchairs, made up to the nines, bedecked and bejewelled, they gave me pause for thought. These feisty ladies are a different kind and seem determined not to go gently into the good night. They truly are an inspiration. The motto above the town hall says it all: The people are the city. 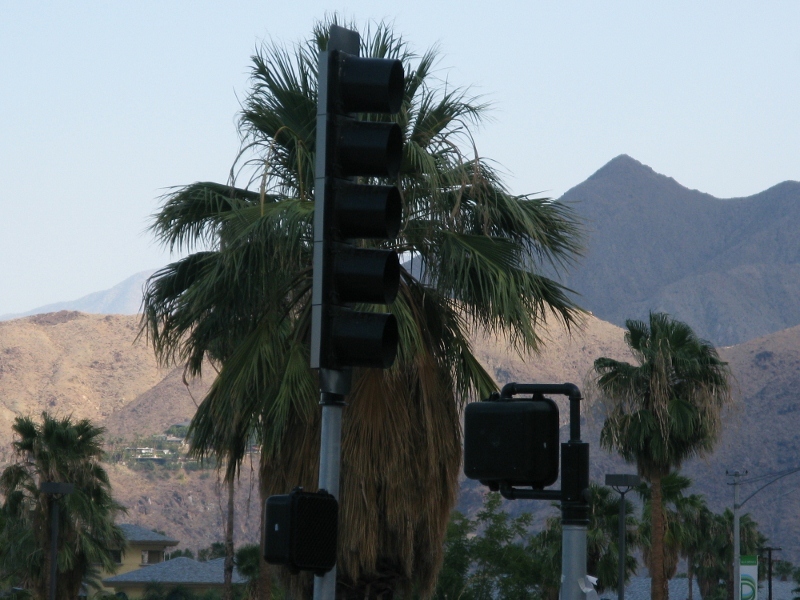 Palm Springs has been inhabited for more than 2000 years. 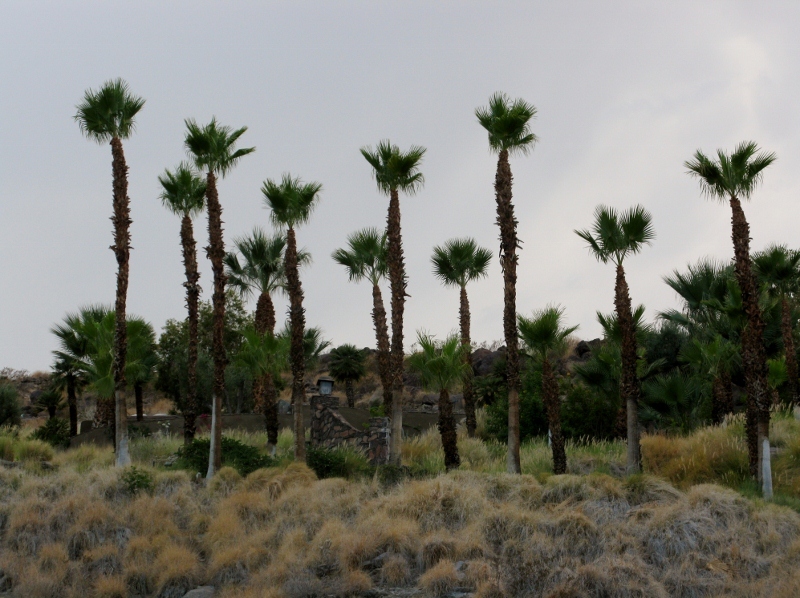 An oasis in the desert, the city itself was incorporated in 1938. It’s a place where the mountains literally rise out of the ground and stand sentry. The sun highlights some peaks and casts others into deep shadow. Palm trees reign surpreme and I assumed that this was where the city got its name. 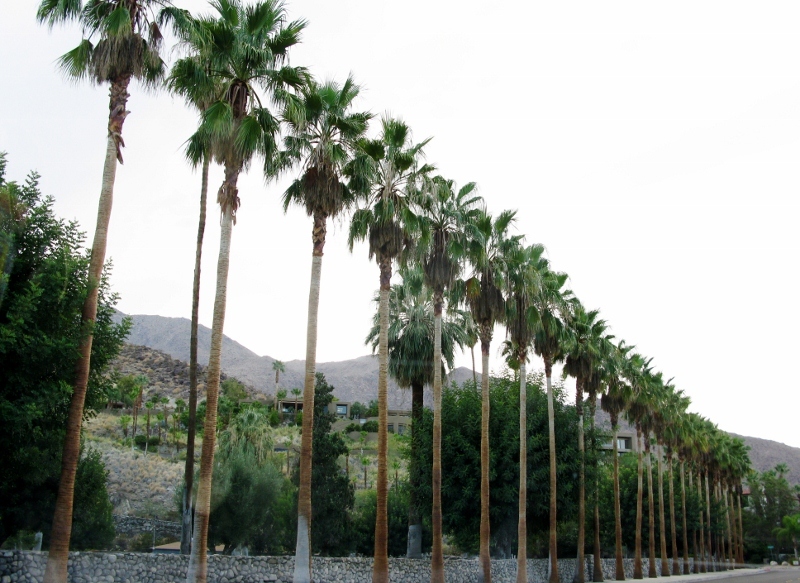 But palm trees don’t grow in straight lines – at least not naturally! When they happened across the area in the early nineteenth century, Spanish explorers called the place, ‘Ague Caliente’ (hot water). So we have the ‘springs’ part explained. They also referred to it as La Palma de la Mano de Dios or The Palm of God’s hand. Hence the palm. Others say that there were two palm trees beside the spring but that’s a little too obvious if, perhaps, the most likely explanation. 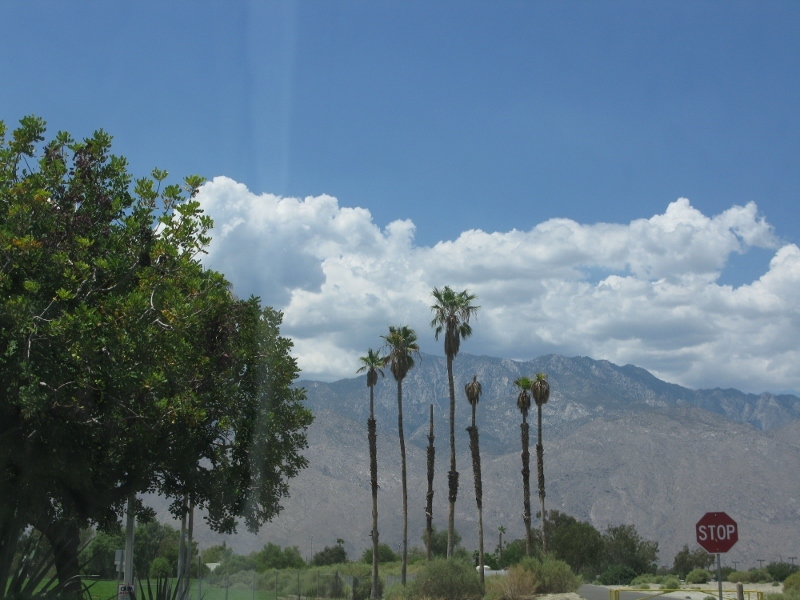 First inhabited by the Agua Caliente Band of Cahuilla Indians, the reservation itself officially began in 1896. Then the movie stars came east from California and in the 1920s, the city began to boom. Home to the greats like Frank Sinatra, Elvis Presley, Lucille Ball, and Bob Hope, the street names still tell their stories. During World War II, General George S. Patton’s troops used the desert to train for their invasion of North Africa. The old El Mirador Hotel (that had a full grown lion in a cage over the entrance) and which is now the site of today’s Desert Regional Medical Center, once served as Torney General Hospital, treating US wounded. The hospital was staffed by Italian prisoners of war, housed at the adjoining detention camp. More recently, it’s famous as a film location with the likes of Ocean’s 11 and Diamonds are Forever being shot there. The city practically closes for the summer (May-September) and reopens in October. With temperatures as high as 120 degrees, it’s not surprising really. 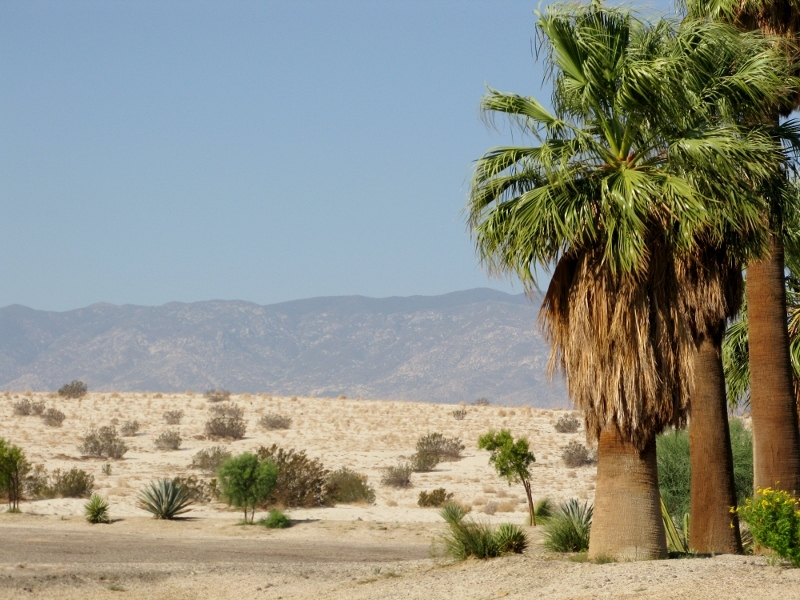 Many residents are snowbirds – those who come to the desert to escape the winters of Alaska and Canada. Many are retired. For the first time in a long time, I was the youngest in the room. But even that wouldn’t entice me to move. Lovely place with some jaw-dropping scenery. But it’s too damn hot.